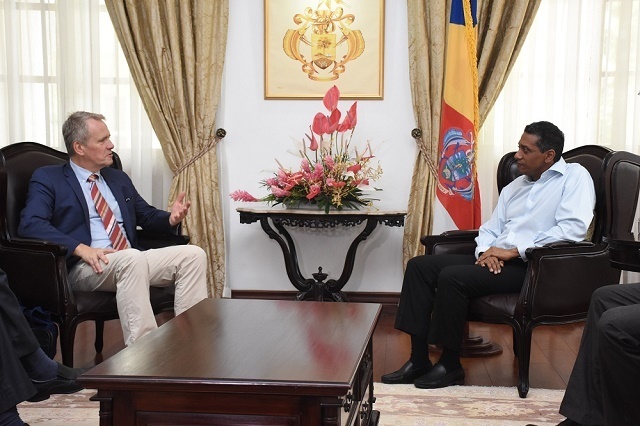 (Seychelles News Agency) - A special envoy of Norway met with Seychelles’ President on Tuesday to discuss work that can be done in the fields of the blue economy, climate change and renewable energy. On an official visit to Seychelles, Odd-inge Kvalheim said that these areas are important as they are top priorities and common interest of the two countries. “Seychelles is a champion on the blue economy in the African continent and being such an important actor in this region, we need to cooperate closely on that. Our Prime Minister has taken the initiative to establish a high-level panel on the sustainable ocean economy and this is global work,” said Kvalheim. Other areas of cooperation touched during discussions were fisheries management, integrated ocean management, the fight against fisheries crime and the health of the ocean, especially when it comes to marine pollution. The visit of the Special Envoy was also an opportune time for Seychelles, a group of 115 islands in the western Indian Ocean, to discuss the financing of certain projects. Before his meeting with the Seychelles’ president, Kvalheim met with Secretary of State for Foreign Affair, Barry Faure, on Monday. The two diplomats had lengthy discussions on how Seychelles can benefit through a number of projects. Speaking to the press on Tuesday, Barry Faure said that Norway offers development aid on both bilateral and multilateral levels. “As you know, Seychelles no longer qualifies to benefit from development aids on a bilateral level. The possibility for us to get access to development aids from Norway will be through programmes financed by Norway through multilateral organisations such as the World Bank, UNODC and IUCN,” said Faure. The state secretary added that when President Danny Faure met with the Prime Minister of Norway at the G7 Summit held in Canada last year, they discussed the need to establish financing programmes, that countries such as Seychelles can get access to. “Thanks to this conversation, Norway put in place a programme with the World Bank called PROBLUE,” said Barry Faure. PROBLUE is a new multi-donor trust fund that will support healthy and productive oceans by tackling marine pollution, managing fisheries and fostering the sustainable growth of coastal economies. Although Seychelles does not benefit from Norway at a bilateral level, the island nation benefits in other forms. Mid last year, two Seychellois benefitted from a two-week training on board the Dr. Fridtjof Nansen, a Norwegian vessel carrying out a survey within a joint maritime jurisdiction between Seychelles and Mauritius. Equipped for advanced and multidisciplinary marine research, the Dr. Fridtjof Nansen is owned by the Norwegian Organisation for Development Cooperation (NORAD). Researchers from the Norwegian Institute of Marine Research assisted with the training.